I AM VERY PASSIONATE ABOUT MASSAGE. I HAVE WORKED AS A MASSAGE THERAPIST FOR THE PAST 14 YEARS. My name is Karen Grant. I am a qualified Remedial Massage Therapist in the Wynnum area. My qualifications were received through Tafe and College in Adelaide also many workshops and seminars throughout the years. I have worked in the massage industry for 14 years both here in Brisbane and Adelaide. I have experience working with many different types of people and various Issues professional athletes, sporting clubs, entertainers, health practitioners, cancer patients, pre and post-natal clients, chronic pain sufferers, and people who respect and value massage and bodywork as a part of their personal health care. In today’s society, where stress-related, psychological and physiological health problems are common, in which massage plays a significant role. Not only can massage increase the general health and wellbeing, remedial massage can complement medical treatment for conditions such as sports injury. I adapt every treatment according to the needs of each client I specialize in outcome based massage and bodywork. My goal is to alleviate any discomfort, provide my client with a sense of well being, release muscle tension and improve posture. As with any industry, there are constant changes and new ideas, for this reason, I will continue attending workshops to improve my knowledge within the industry. 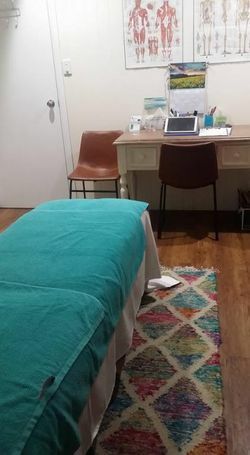 I massage at Wellness on Wellington Chiropractic Centre Level 1 Shop 20/685 Old Cleveland Rd East Wellington Point on Thursday afternoon (or later) and at 11 Clara St Wynnum on Mondays, Tuesdays, Wednesdays Thursdays, Fridays and Saturday (alt). To make an appointment for Karen and Jenny at Wynnum and Karen at Wellness on Wellington Phone: 3195 4442, Mobile: 0427 392 231. I look forward to helping you achieve your optimum health and well-being, both now and in the future. I am a Member of the Australian Association of Massage Therapists (AAMT). I have EFTPOS and treatments can be claimed with all Health Funds. Conditions: * Must have a Pension card, plus show each time it is renewed.